Your Choice for South Calgary Dental Implants! 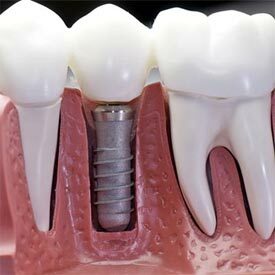 Dental implants replace missing teeth using an artificial root made of titanium metal or ceramic. If you are looking to replace missing teeth with a high functioning and natural looking restoration, our South Calgary Dental Implant treatment might be the solution you are looking for. Implants are surgically placed into your jawbone and are fit with a dental crown or bridge, to complete the restoration. Implants are the closest restoration to your natural teeth, which allows you to enjoy many of the foods you have missed out on. Implants can benefit those missing some or all of their teeth. Dental implants can be used individually, or to support a number of dental prostheses, including implant-supported bridges and dentures. Dental implants help improve how dentures fit when concerns such as inadequate bone level are causing your dentures to fall out or shift, even after a detour reline. Dental implant supported dentures relieve pain and irritation to the gum tissues, and there is no longer the need for the use of denture adhesives because the dental implants “clip” the denture into place. Implants are a permanent restoration, and unlike a denture or partial denture, it is not necessary to remove the dental implant at night. Dental implant treatment is recommended for healthy people that have adequate bone levels in their jaw to support the dental implant. Healthy gum tissues that are free of periodontal disease is also a must in order for your dental implant treatment to be successful. We know that replacing your missing teeth with a high functioning restoration is important to you which is why we offer South Calgary Dental Implants to help you achieve your goal for optimum dental health. Call us today at (403) 254-1124 to schedule your appointment with Dr. Roman Koutsil to learn more about your options for South Calgary Dental Implants at Shawnessy Smiles Dental Clinic! Disclaimer: Dr. Roman Koutsil is a general dentist, not a cosmetic dentist specialist. Cosmetic dentistry is not a term/specialty recognized by the Alberta Dental Association & College (ADA&C). Dr. Koutsil provides cosmetic dental procedures such as porcelain veneers, dental implant crowns, dental bonding, and teeth whitening as part of his general dentist license.